2017 Holiday AC Bonus Begins Tomorrow! 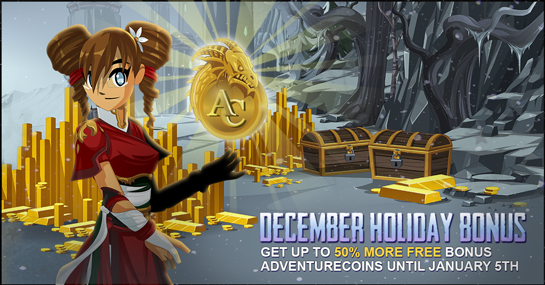 Starting NOW and until January 5th, buy any Adventure package and get up to 50% more FREE bonus ACs! 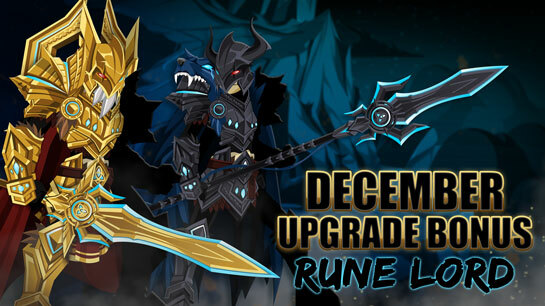 Upgrade in December to Unlock the Rune Lord set! Starting this Friday, December 1st, at 6 PM EST, buy any AdventureCoin or Membership package of $10 USD or more to unlock the exclusive RuneLord armor set December upgrade bonus items! Get the Rune Lord gear and the Wolf Lord set with a 12 month membership or 12000 AC package. All packages will also come with the Rune Lord character page badge, so you can show all your friends who REALLY dominates the Mirror Realm! The December bonus gear goes rare January 5th, 2018. UPDATE - If you purchased an upgrade package after 4:30 PM EST (when the release went live) but before 6 PM EST tonight (when the packages/bonus go live), we'll run a query on Monday to make sure you get your upgrade gear / bonus ACs.